Here's a tasting menu of the most promising exhibitions in the coming months. BUFFALO "Clyfford Still/Mark Bradford." Mr. Bradford selects some 20 paintings by Still (1904-80) and, in adjacent galleries, presents new abstract works he made in response to them, in that way starting a dialogue about Abstract Expressionism. May 26 through Oct. 2. Albright-Knox Art Gallery, 1285 Elmwood Avenue; 716-882-8700 , albrightknox.org. 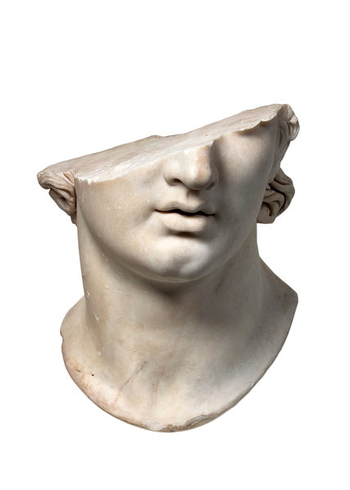 Colossal Head of a Youth, from the Met's Pergamon exhibition. NEW YORK "Pergamon and the Hellenistic Kingdoms of the Ancient World." This international loan exhibition reveals the profound legacy of Greek civilization through the display of more than 265 objects, from bronze, marble and terra-cotta sculptures to gold jewelry, made between the death of Alexander the Great in 323 B.C. and the birth of the Roman Empire in the first century B.C. April 18 through July 17. Metropolitan Museum of Art; 212-535-7710, metmuseum.org. NEW YORK "Unfinished: Thoughts Left Visible." With 190 works, all unfinished, dating from the 15th century to today, this inaugural exhibition of this new outpost of the Met examines works that were never finished by the artists, exposing the creative process, and those that in some cases were purposely left incomplete to signify an unresolved meaning. March 18 through Sept. 4. Met Breuer, 945 Madison Avenue, at 75th Street; 212-731-1675 , metmuseum.org. NEW YORK "Stuart Davis: In Full Swing." From 1940 on, Davis mined popular culture, advertising images, Cubism, jazz rhythms and his own earlier works to make distinctive paintings that, as some 100 works here show, pulse with wit and energy. June 10 through Sept. 25. Whitney Museum of American Art, 99 Gansevoort Street, at Washington Street, meatpacking district; 212-570-3600, whitney.org. PHILADELPHIA "Creative Africa." A series of five shows, featuring works ranging from 400-year-old bronzes and ivories from Benin to contemporary textiles, street photography and architecture, portray the artistic diversity of sub-Saharan Africa. Opening May 14, with varied closing dates for the shows. Philadelphia Museum of Art, 2600 Benjamin Franklin Parkway; 215-763-8100 , philamuseum.org. WASHINGTON "In Celebration of Paul Mellon." Works on paper and illustrated books by Winslow Homer, Ingres, van Gogh, Picasso and many more artists evoke the intimate pleasure this celebrated collector took in his collections. May 8 through Sept. 18. National Gallery of Art, National Mall between Third and Seventh Streets, at Constitution Avenue NW; 202-737-4215 , nga.gov. WASHINGTON "Robert Irwin: All the Rules Will Change." A survey of the artist's work from 1958 to 1970, as he turned from small abstract paintings to large acrylic discs and columns, and then his trademark site-specific works of light and space. The exhibition includes a new immersive installation by him. April 7 through Sept. 5. Hirshhorn Museum and Sculpture Garden, National Mall, at Independence Avenue SW and Seventh Street; 202-633-1000, hirshhorn.si.edu. WASHINGTON "Turquoise Mountain: Artists Transforming Afghanistan." Gallery space is transformed through an immersive installation of photographs, videos and interactive displays into a vibrant marketplace in old Kabul, where artisans from Afghanistan make jewelry, calligraphy, ceramics, woodwork and other crafts. Through Jan. 29, 2017. Arthur M. Sackler Gallery, Smithsonian Institution, 1050 Independence Avenue SW; 202-633-4880 , asia.si.edu. DENVER "Women of Abstract Expressionism." With more than 50 works made by Joan Mitchell, Helen Frankenthaler and others in the 1940s and '50s, this exhibition celebrates the often overlooked female artists of this pivotal American movement. June 12 through Sept. 25. Denver Art Museum, 100 West 14th Avenue Parkway; 720-865-5000 , denverartmuseum.org. LOS ANGELES "Robert Mapplethorpe: The Perfect Medium." About 150 photographs, from the early 1970s through the 1990s, and drawn from the artist's estate, provide a survey of his career. Through July 20. J. Paul Getty Museum, 1200 Getty Center Drive; 310-440-7300 310-440-7300, getty.edu. A companion show of the same title runs from March 20 through July 31 at the Los Angeles County Museum of Art, 5905 Wilshire Boulevard; 323-857-6000 , lacma.org. LOS ANGELES "Cave Temples of Dunhuang: Buddhist Art on China's Silk Road." Paintings, objects and manuscripts that have rarely, if ever, traveled to the United States, are accompanied by reproductions of three of these 500 Buddhist caves in the Gobi Desert, which date from the fourth to the 14th century. May 7 through Sept. 4. Getty Conservation Institute, Getty Center, 1200 Getty Center Drive; 310-440-7300 , getty.edu. LOS ANGELES "Agnes Martin." A traveling retrospective explores the artist's early little-known experiments in various media and traces her journey from biomorphic abstraction to the grids and stripes that made her reputation. April 24 through Sept. 11. Los Angeles County Museum of Art, 5905 Wilshire Boulevard; 323-857-6000 , lacma.org. PORTLAND, ORE. "Contemporary Native Photographers and the Edward Curtis Legacy: Zig Jackson, Wendy Red Star, Will Wilson." The works of three American Indian photographers are presented in dialogue with historical images that romanticized tribal life and helped shape views of Native Americans. Through May 8. Portland Art Museum, 1219 SW Park Avenue; 503-226-2811, portlandartmuseum.org. SAN FRANCISCO "Oscar de la Renta: The Retrospective." More than 130 couture items designed over five decades, in many cases for well-known personalities, trace the career of this influential designer. Through May 30. De Young Museum, 50 Hagiwara Tea Garden Drive; 415-750-3600 , deyoung.famsf.org. SAN FRANCISCO "Emperors' Treasures: Chinese Art From the National Palace Museum, Taipei." With around 150 items, including 30 very rare objects, this exhibition of paintings, calligraphy, bronze vessels, ceramics, lacquerware, jades, textiles and documents examines how eight rulers from the early 12th through the early 20th century contributed to the arts. June 17 through Sept. 18. Asian Art Museum, 200 Larkin Street; 415-581-3500, asianart.org. SEATTLE "Graphic Masters: Dürer, Goya, Rembrandt, Picasso, Matisse, R. Crumb." Six centuries of printmaking are represented in around 400 works of art, highlighting the importance of the graphic arts as a form of expression and experimentation. June 9 through Aug. 28. Seattle Art Museum, 1300 First Avenue; 206-654-3100 , seattleartmuseum.org. CHICAGO "Kerry James Marshall: Mastry." This is the first museum retrospective of this chronicler of the African-American experience, whose landscapes, portraits and history paintings often refer to art history or to muralist and comic-book traditions. April 23 through Sept. 25. Museum of Contemporary Art, 220 East Chicago Avenue; 312-280-2660 , mcachicago.org. CINCINNATI "Daubigny, Monet, Van Gogh: Impressions of Landscape." Although Daubigny was a seminal influence on Impressionist painters, his role has largely been overlooked. This major international exhibition displays around 40 of his most important works, alongside paintings they inspired. Through May 29. Taft Museum of Art, 316 Pike Street; 513-241-0343 , taftmuseum.org. CLEVELAND "Pharaoh: King of Ancient Egypt." What was it like to be a pharaoh? Using about 100 objects, this exhibition attempts to answer that question and illustrates how these rulers were depicted, from around 3000 B.C. onward. Through June 12. Cleveland Museum of Art, 11150 East Boulevard; 216-421-7350 , clevelandart.org. DETROIT "Dance! American Art, 1830 to 1960." More than 90 paintings, sculptures, photographs, costumes and videos celebrate the importance of dance in American culture, from the sacred rituals of Native Americans through dance forms of the Harlem Renaissance to modernism. March 20 through June 12. Detroit Institute of Arts, 5200 Woodward Avenue; 313-833-7900 , dia.org. KANSAS CITY, MO. "Luxury: Treasures of the Roman Empire." More than 125 pieces of gold jewelry, silver, ivory, gemstones and bronze, including a trove of magnificent silver discovered in northern France, offer a rare look at the private and public display of wealth by the Roman elite over five centuries. July 9 through Oct. 2. Nelson-Atkins Museum of Art, 4525 Oak Street; 816-751-1278 , nelson-atkins.org. 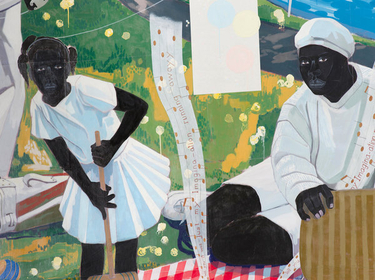 Kerry James Marshall's "Past Times." MINNEAPOLIS "Less Than One." An in-depth look at the art of Jasper Johns, Kara Walker, Meredith Monk, Joan Jonas and 12 other artists whose provocative, risk-taking work in many media is central to the Walker's collection. Several major acquisitions will be introduced. April 7 through Dec. 31. Walker Art Center, 1750 Hennepin Avenue; 612-375-7600 , walkerart.org. ST. LOUIS "The Carpet and the Connoisseur: The James F. Ballard Collection of Oriental Rugs." A display of 51 rugs, mostly from Anatolia but also from Egypt and Spain, and featuring patterns seen in Renaissance paintings. Two 19th-century Persian pleasure tents, which were used for outdoor gatherings, also help capture the aesthetics of Mr. Ballard, a local businessman and world traveler who donated rugs to the Metropolitan Museum in New York. Through May 8. Saint Louis Art Museum, 1 Fine Arts Drive, Forest Park; 314-721-0072, slam.org. TOLEDO, Ohio "Hot Spot." Around 70 contemporary sculptures by glass designers, including William Morris and Joyce J. Scott, some never before exhibited, are gathered to celebrate the 10-year-old Glass Pavilion, which houses a permanent collection of 5,000 works, ancient to modern. April 15 through Sept. 18. Toledo Museum of Art, 2445 Monroe Street; 419-255-8000 , toledomuseum.org. ATLANTA "Walker Evans: Depth of Field." An international exhibition, featuring more than 120 photographs from the 1920s through the 1970s, showcases the career of this artist, whose images of the South during the Great Depression helped define American documentary photography. June 11 through Sept. 11. High Museum of Art, 1280 Peachtree Street NE; 404-733-4444, high.org. BENTONVILLE, Ark. "The Open Road: Photography and the American Road Trip." This survey of some 90 images by William Eggleston, Robert Frank, Justine Kurland and 16 others, taken from the 1950s to today, presents the road as muse, revealing America through its wayside motels, national monuments, theme parks and other features. Through May 30. Crystal Bridges Museum of American Art, 600 Museum Way; 479-418-5700 , crystalbridges.org. HOUSTON "High Society: The Portraits of Franz X. Winterhalter." No portraitist was more admired by the 19th-century European aristocracy than Winterhalter, as some 45 lush canvases here demonstrate. Couture garments like those worn in the paintings add atmosphere. April 17 through Aug. 14. Museum of Fine Arts, 1001 Bissonnet; 713-639-7300 , mfah.org. MIAMI "Michele Oka Doner: How I Caught a Swallow in Midair." A showcase of the long career of this Miami-born artist, whose works draw inspiration from Florida's flora and fauna, coincides with the Miami City Ballet's presentation of "A Midsummer Night's Dream," for which she designed the sets and costumes. March 24 through Sept. 11. Pérez Art Museum Miami, 1103 Biscayne Boulevard; 305-375-3000 , pamm.org. SAN ANTONIO "Highest Heaven: Spanish and Portuguese Colonial Art From the Roberta and Richard Huber Collection." More than 100 works made in the 18th century in the high plains of South America show how art inspired by the Old World figured in daily life in the new one. June 11 through Sept. 4. San Antonio Museum of Art, 200 West Jones Avenue; 210-978-8100 , samuseum.org. WEST PALM BEACH, FLA. "O'Keeffe, Stettheimer, Torr, Zorach: Women Modernists in New York." As conceptions of women were changing in the early 20th century, these four artists blazed new trails in art. Presenting more than 60 works, this show illustrates their different yet sometimes intersecting paths. Through May 15. Norton Museum of Art, 1451 South Olive Avenue; 561-832-5196 , norton.org. BOSTON "Megacities Asia." Eleven contemporary artists comment on the environment, scale and pace of Beijing, Shanghai, Mumbai, Delhi and Seoul, in nearly 20 new monumental sculptures and installations, including works created on-site during the exhibition. April 3 through July 17. Museum of Fine Arts, 465 Huntington Avenue; 617-267-9300 , mfa.org. BOSTON "Nalini Malani: In Search of Vanished Blood." India's best-known video and installation artist presents works on paper along with her signature piece: six video projections that mix Eastern and Western images and are streamed through five hand-painted Mylar cylinders. July 1 through Oct. 16. Institute of Contemporary Art, 100 Northern Avenue; 617-478-3100, icaboston.org. BRUNSWICK, ME. "This Is a Portrait if I Say So: Identity in American Art, 1912 to Today." This exhibition examines the evolution of symbolic, abstract and conceptual portraiture with more than 60 works by artists including Charles Demuth, Gertrude Stein and Yoko Ono. June 25 through Oct. 23. Bowdoin College Museum of Art, 9400 College Station; 207-725-3275 , bowdoin.edu/art-museum. SALEM, MASS. "Asia in Amsterdam: The Culture of Luxury in the Golden Age." Some 170 works borrowed from more than 60 collections reveal the transformative impact that luxury objects from Asia, like porcelain, lacquer and textiles, had on Dutch art and life in the 17th century. Through June 5. Peabody Essex Museum, 161 Essex Street; 978-745-9500 , pem.org. WILLIAMSTOWN, MASS. "Splendor, Myth and Vision: Nudes From the Prado." Twenty-eight old master paintings, including works by Titian and Velázquez, illustrate the taste of Spanish kings from the late 16th to early 19th centuries. Most of them have never been exhibited in the United States. June 11 through Oct. 10. Clark Art Institute, 225 South Street; 413-458-2303, clarkart.edu. WORCESTER, MASS. "The Captivating Cat: Felines and the Artist's Gaze." More than 70 works, from ancient Egypt through the Renaissance and to modern times, document the cat as a source of artistic inspiration. May 21 through Sept. 4. Worcester Art Museum, 55 Salisbury Street; 508-799-4406 , worcesterart.org.